“Manfred Gurlitt (1890-1972) was the unlucky composer whose WOZZECK was first performed in 1926, a few months after the premiere of Alban Berg's version. He followed it with an opera based upon Lenz's DIE SOLDATEN and lived to see that, too, totally eclipsed in the 1960s by Bernd Alois Zimmermann's multidimensional treatment of the same subject. NANA, based upon Emile Zola's novel, with a libretto by Kafka's biographer Max Brod, was Gurlitt's next project. It has fared little better. 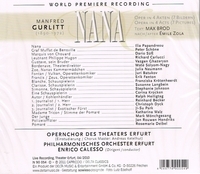 Gurlitt completed the score in 1933, but was unable to perform it in Nazi Germany; the premiere of NANA eventually took place in Dortmund in 1958. This is its first commercial recording, taken from a production in Erfurt last year.